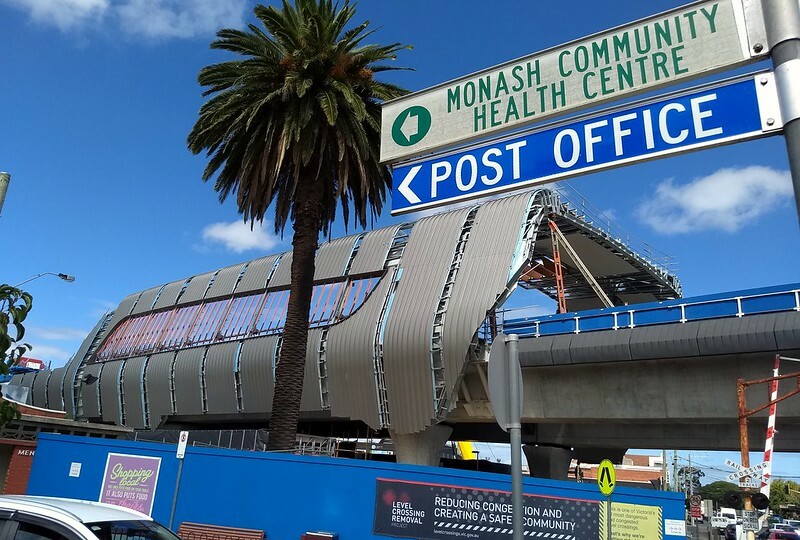 Now that the new Noble Park station (aka “Area 3” of the Caulfield to Dandenong “skyrail”) is open, what of the rest of the project? It’s moving fast. “Area 2” in the Clayton area is coming along, and a rail line closure from the 3rd to the 15th of April will allow construction workers to hook up the new elevated section and get Clayton station opened. Importantly, grade separation at Clayton Road will also markedly cut delays for buses. Three routes currently cross the rail line here, often suffering delays due to train delays keeping the boom gates closed, or faults. 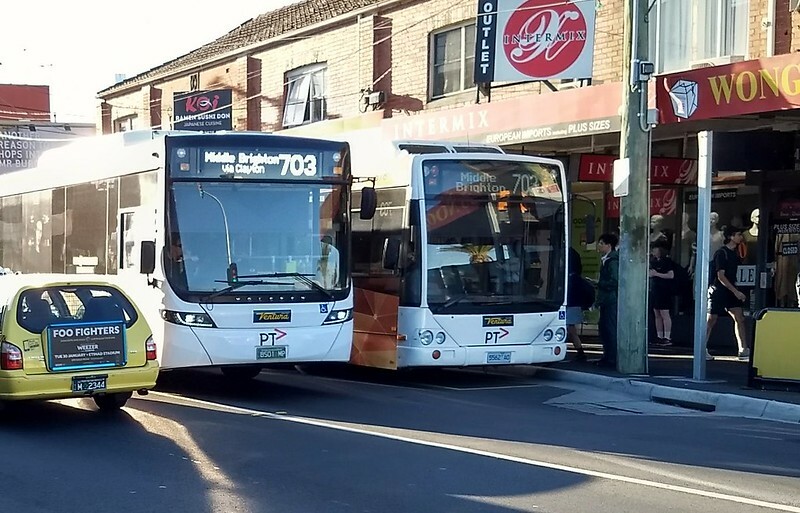 All three are quite long routes, so this will bring benefits to bus passengers right across the east and south-east of Melbourne. So by the time the Easter school holidays are finished, the new Clayton station should be open, with trains running above Clayton and Centre Roads. Meanwhile in “Area 1” (Caulfield to Hughesdale), the straddle carrier is expected to have finished by the time you read this. The main reason it’s been used to build the elevated railway in this section is because of the lack of space in the rail corridor – which is also why this section has been so controversial. Courtesy of the Level Crossing Removal Authority (LXRA), I got to go up onto the elevated structure and take a closer look at the straddle carrier last Tuesday, along with various other advocates, bloggers and stakeholders. 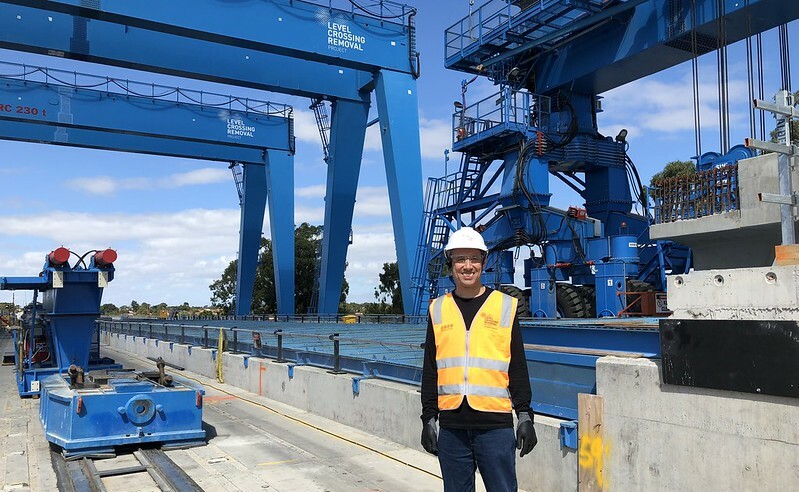 The big blue things towering above the rail line (behind me on the left) are gantry cranes, designed to lift the pre-built sections of elevated structure up off the ground, to where the straddle carrier (on the right) can get them. The existing Murrumbeena and Carnegie stations are both operational as works continue. Hughesdale has been closed for some time, as this is where the trains will come back down to street level. Shown above, at Murrumbeena, the main wraparound shelter for the new station is taking shape. Platforms will accommodate the new 7-car High Capacity Metro Trains, with future provision for platform extension to 10-cars. Work will be ongoing as trains continue to run underneath. Not confirmed yet, but expect a shutdown during the winter school holidays to hook up this section and get it operational. 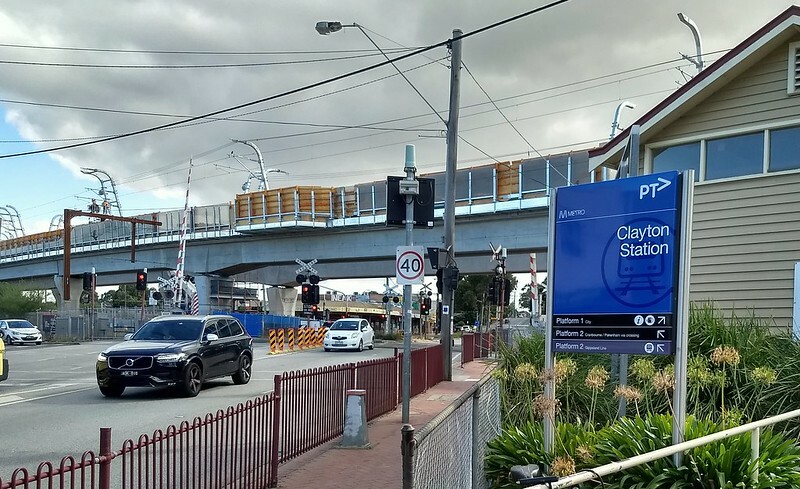 Because the new Clayton station is being built alongside the existing station, they’ve already installed escalators, and lifts should be available from day one of operation, just like at Noble Park. But it’s a different story at Carnegie and Murrumbeena, where the new stations are directly above the old ones. 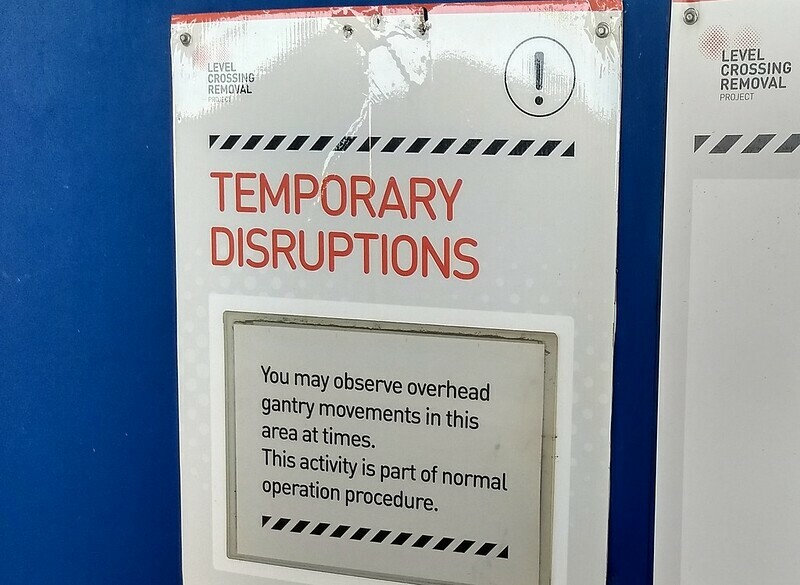 It sounds like temporary stairs may be necessary – with those requiring stepfree access initially using a shuttle bus to another station until lifts are installed a few weeks later. Mostly this project seems to have been achieved without long disruptions to rail users, at least, not as long as those felt on lines where tracks have been dug up and lowered into a cutting/trench. That said, those who travel in the evenings (particularly Sunday to Wednesday) must be getting used to regular replacement buses. And I’m told rail shutdowns will continue after all the level crossings from Caulfield to Dandenong have been removed. 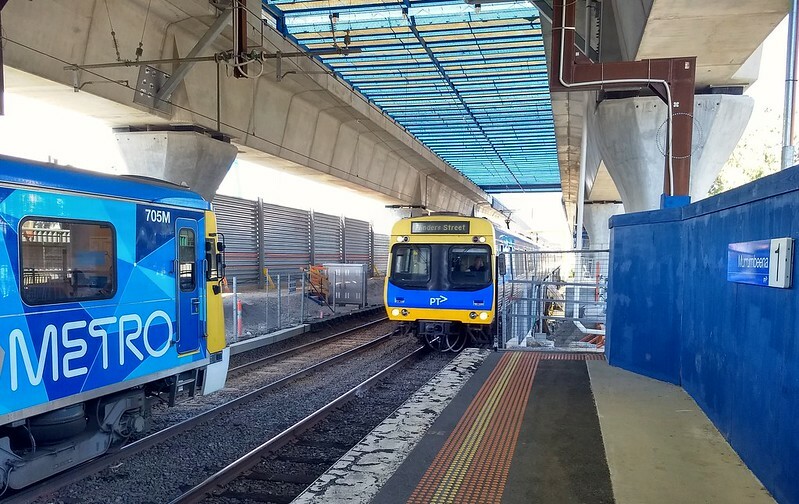 Upgrades to signalling and power and platforms to cater for the new High Capacity Metro Trains (HCMTs) will be ongoing for a while yet, until they come into service sometime next year. Tens of thousands of people use the Dandenong line every day, and it’s only going to get busier. It’s great to see it finally getting the investment and upgrades it has needed for so long. Next → Next post: Smartbus vs train: What’s faster for orbital travel? Have they made Clayton Rd safe for cycling? How wide are those elevated sections, on the single track sections? When I travelled along the line on Thursday and Friday of last week, it is clear that there was only one section of area 1 to be done, and that is the UP (to Melbourne) bridge/structure at the Hugesdale end. The Area 2, sure looked almost finished from what I could see from the train. The overhead wire was in place over the majority of the structure, and most of the remaining staunchens have also been put in. I guess there is very little more to be done on area 2, other than the hooking up at each end. The straddle carrier is still 5 spans away from finishing as of daytime Monday. There is 1 span left to install on the western side of Poath Rd, the span over Poath Rd it self and the final 3 spans on the eastern side. The skyline in the Carnegie photo is set to change quite a bit over the next couple of years. 1060 Dandenong Rd is about to be built (where the grungy concrete/fibro-cement warehouse is in the photo to the right of Officeworks, the reason for the section of higher sound/privacy barrier), a taller section of the Development on the old Caulfield Racecourse car park (between the racecourse and the railway, will be visible over the billboard with the Camry ad (Carnegie station roof permitting)) is having its foundations and basement built at the moment and various smaller and/or further away developments. 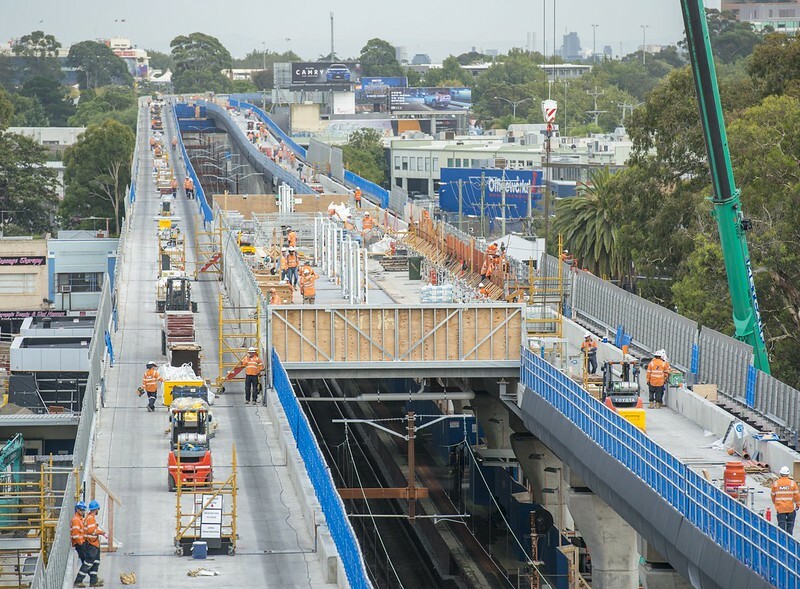 I was at Hughesdale today and the there is only one or two spans to go – it was up to Poath Road, but the carrier was down at Murrumbeena. As a 30 year commuter out of Clayton, I would often beat the 631 bus home (25 minute walk from the station), as it was marooned north of the crossing. Guess that’s about to change – about time. It seems a waste not to keep the four tracks. I was also there on Monday morning. Sorry @Doug, but @Tom is correct. Once Poath road is crossed (possibly as soon as tonight), they will place another three spans to match the Northern “Down” line. I expect they will finish dropping spans by the end of the week. However my expectations have been wrong before. The “Down” line was approaching Poath Road just before Christmas. I thought they would cross early in the new year, but they didn’t lay any spans in Hughesdale for two months – from 20-Dec-2017 to 20-Feb-2018. Anyhow, I was green with envy when I saw Daniel’s selfie up top at Murrumbeena. Has there ever been any mention of why they have only gone with just the 2 tracks instead of 3 or 4? Seems like an obvious time to put more than 2 lines in considering the freight and V/Line connections. I think I once saw a “there is a provision for additional tracks” somewhere, but the idea just doesn’t seem to rate a mention anywhere. Granted I’m not a user of this line so I don’t know how possible it even is, but I can’t imagine Gippsland trains getting any faster if they have to squeeze between Metro trains that are running every 5 mins or so. The 2nd pic is concerning. If they ever add 2 tracks, are they going to have to rip apart the station walls or basically rebuild the station? Would it not be better to make the stations like they are in Tokyo – 4 tracks and the platforms serve the 2 outermost tracks while the 2 innermost tracks are for express services. BTW, interesting to see you wear gloves in addition to the hard hat! A new safety requirement? @TranzitJim, the single track elevated structures are wide enough for the track itself, and an access path. @enno, if they kept the ground level tracks, it wouldn’t be much of a level crossing removal project. In any case, in some sections they need that space for station access, and train ramps to/from the elevated structure. And a key selling point of elevated rail is being able to provide space for community use. @Harley, there are two issues: capacity and speed. Capacity is being handled by enabling more trains that are much larger. This post has some details, but the combination of changes means about double the carrying capacity by 2025, compared to 2015. Speed is harder, but for now most freight will continue to be outside peak times, and yes V/Line will just have to roll along between Metro services. Track expansion would require completely filling the current corridor with tracks, and in places mass property acquisition, so they’ve decided it’s not a priority for now. @Jacob, if they ever add an additional 2 tracks, these would run outside the track structure (probably along the south side of the corridor, mostly) and with no platforms at most stations – they’d be used for express/freight trains anyway. Yeah they’re very strict on PPE (Personal Protective Equipment). 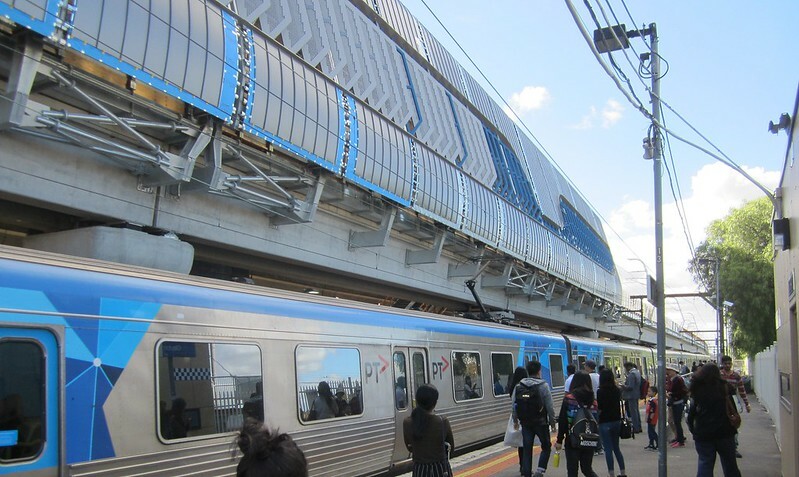 The Rail Futures Institute, is campaigning for two tracks along the route of the Princess Highway between Dandenong and Southern Cross, with stops at Monash, Chadestone, and Caulfield only. The idea is, for all Gippsland V/Line services to use this route, along with a steady flow of Metro services too, also using the same express pattern. Looking at that structure above, I do feel, they should be able to put in a third track in the middle, with that being an express track. That would help V/Line services greatly. Wouldn’t a third track be some sort of a false economy? It’ll be some sort of enhanced passing loop that adds complication to the timetable as you have to consider the express service from both directions. Skyrail above the tracks Caulfield-South Yarra and the existing tracks between South Yarra and Southern Cross seems more affordable, useful and politically saleable than somehow getting skyrail through Southbank and South Melbourne. Using the existing wide corridor between Westall and Dandenong seems easier and more convenient and permits building in the project in stages (Caulfield-Westall has the most express-stopper conflict because of the stopping patterns and is thus the priority) and switching lines in case of disruptions/works. Using the existing corridor Caulfield-Oakleigh for an additional pair of tracks would be very expensive and disruptive to the rail line and its surrounds and the Dandenong Rd corridor is a better option than the existing rail corridor. The most complicated section is the Oakleigh-Westall section. Connecting to Oakleigh station would require some quite sharp turns (of the sort not conducive to express railway speeds) in and out of Warrigal Rd (and possibly land acquisition over and above the remaining Warrigal Rd widening acquisition) and the possible replacement of the Warrigal Rd bridge over the railway with an underpass but would provide the best interchange for connecting to Chadstone and leave the existing Clayton stop for Monash Medical Centre intact. Options for connecting between Oakleigh and Westall are limited by significant land acquisition requirements. Connecting to Westall, via Westall Rd is the easiest option. Chadstone and Monash Clayton, while they do have some patronage from a greater distance, are primarily serving the surrounding few kilometres and are thus unsuited to express line stations. Monash Clayton would be best served by a Rowville line along Wellington Rd and Chadstone would be best served by an extension of the Alamein line to Oakleigh via East Malvern. For V-Line to receive the full benefit of a third track it would indeed have to be operated as a bidirectional passing loop during the entire daytime, rather than as a peak express track like on the Belgrave/Lilydale and Frankston lines and would be a contrast to the recently funded duplication Bunyip-Longwarry, to avoid single track delays on the Gippsland line. This would be one of the reasons that instead of third tracks from Footscray to Sunshine and Newport being built, an extra pair of tracks was built Footscray-Sunshine and the Manor-Deer Park West line was built to divert the Geelong line trains. Does the new Clayton station have an entrance on both sides of Clayton Road ? This would make it easier for transfers to and from buses, and reduce delays to motorists and buses from the pedestrian lightsdf. I have seen comments about the Bentleigh and McKinnon stations that they got rid of a train level crossing, only to replace them with a pedestrian level crossing. @Malcolm, no, Clayton will only have an entrance on the eastern side of Clayton Road. However the northbound and terminating buses will loop around, meaning people don’t need to cross the road to interchange. A lady at a forum run by Asher Judah (Bentleigh Liberal candidate) earlier this week complained about the pedestrian lights at Bentleigh station. She said it took several cycles to drive through because people kept crossing. I thought it would be impolite to interrupt her and ask why she thought she was more important than the people crossing — and it wouldn’t be so much of a problem if there wasn’t so much traffic. Of course, a pedestrian crossing is not the same as a level crossing. Any types of traffic lights are not subject to long unpredictable timings like level crossings. They can also be overridden/ignored by emergency vehicles if necessary. Daniel I wish you had asked that lady why she was more important than pedestrians! I see this attitude so often on my walks and it drives me (pun intended!) crazy. From the drivers who see you crossing at a intersection and don’t give way thus making you divert behind them (or out in front into busier traffic), those who stop on pedestrian crossings, those who park over footpaths. This is probably why I often arrive at work in a grumpy mood (though possibly being squeezed into a train with too many people and their iphones, backpacks and BO contributes to that as well). What irony at Bentleigh, the crossing was removed to aid in traffic flows. Only to be back in square one, or worse, because of pedestrians. > Only to be back in square one, or worse, because of pedestrians. No, absolutely not. Anybody who claims this is completely wrong. I suspect that one of the reasons for the new bus loop at Clayton may be a 602 (my guess as to the route number) Monash Uni shuttle to take some pressure of the 601 from Huntingdale by diverting the passengers from further out the Pakenham/Cranbourne lines and also the Gippsland line to a new shuttle. Having northbound but not southbound buses divert by an interchange is potentially indicative of a predicted comparatively dwell time/loading time for northbound buses. @Tom, southbound buses don’t need to divert. The stop on the street will be right beside the station entrance. The need for 4 tracks from Dandenong to the city is more than urgent, as a resident of Berwick the current trains are full in peak times and could run from Berwick to only major stations cutting distance times. With the growth of Pakenham, Berwick , Clyde and Cranbourne train demand will increase exponentially V road capacity. There needs to be an outer rail link dissecting all current lines.